On March 31st, 2017, I was honored to speak in a parallel session at the 2017 ETS Eastern Region Meeting, held at Lancaster Bible College in Lancaster, Pennsylvania.1I spoke at the same conference a year earlier at Liberty University, where I am finishing my undergraduate degree. See the list of links above to purchase and download that presentation. There I presented a paper titled “Dismissive of Hell, Fearful of Death: Conditional Immortality and the Apologetic Challenge of Hell,” which I wrote in response to the claim that unbelievers don’t fear death and annihilation, and thus that conditional immortality will take the proverbial wind out of the sails of the Great Commission.2I also handed out free bookmarks, fanning them out on the table at the center of the conference room in which I presented, as shown in the photo above. Be on the lookout for your opportunity to get yours here at Rethinking Hell! For a cost of $4.00, ETS has made an audio recording of my presentation available for purchase and download here: http://www.wordmp3.com/details.aspx?id=24561. I welcome feedback on my paper, so email me at chrisdate@rethinkinghell.com with your thoughts if you’ve had a listen! 1. ￪ I spoke at the same conference a year earlier at Liberty University, where I am finishing my undergraduate degree. See the list of links above to purchase and download that presentation. 2. 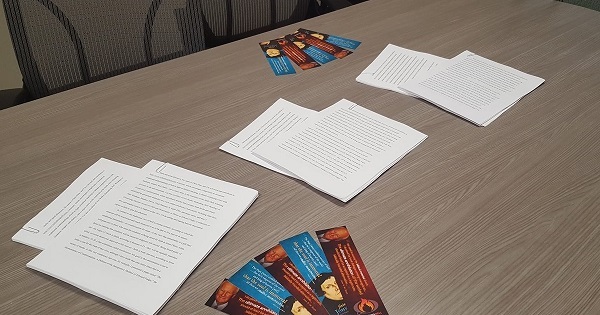 ￪ I also handed out free bookmarks, fanning them out on the table at the center of the conference room in which I presented, as shown in the photo above. Be on the lookout for your opportunity to get yours here at Rethinking Hell! 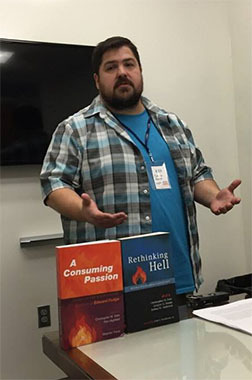 On April 1st, I had the pleasure and honor to speak in a parallel session at the 2016 ETS Eastern Region Meeting, held at Liberty University in Lynchburg, Virginia, where I am earning my undergraduate degree in biblical and theological studies. There I presented a greatly abridged version of a paper I am developing for publication entitled The Hermeneutics of Conditionalism: A Defense of the Interpretive Method of Edward Fudge. For a cost of $4.00, ETS has made an audio recording of my presentation available for purchase and download here: http://www.wordmp3.com/details.aspx?id=21766. I covet feedback on my developing paper, so if you download and listen, please email me at chrisdate@rethinkinghell.com with your thoughts!